Oblong Industries has launched Mezzanine Teamwork, a collaboration tool designed to help enterprises gain a competitive edge in today’s fast-paced working environment. Mezzanine Teamwork spurs productivity by allowing rapid, natural transitions between collaborative phases. New ideas flow because Mezzanine enables teams to create and share in parallel, from any application, and from any location. Research shows that in the heat of creativity, momentum matters. Collaborators lose the thread if they have to take turns or wait. Remote teams are even more likely to suffer from disengagement. 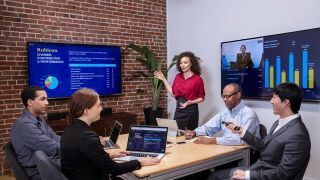 Mezzanine Teamwork transforms meetings and workflows into fluid, immersive experiences with content and control equally accessible to everyone—an experience the company calls “Infopresence”. Teams stay in the flow start to finish, using wands or personal devices to accentuate, order, and winnow possibilities. Oblong's customers include NASA, PwC, IBM, Fujitsu, and Accenture along with other global innovators and forward-thinking brands. The Total Economic Impact Of The Immersive Collaboration Solution, Mezzanine, a commissioned study conducted by Forrester Consulting on behalf of Oblong published in March 2017, documents Mezzanine customer payback in 7.6 months and 226 percent ROI.